Inkvite allows you to work with 3 friends that each write up to 280 characters per turn and an average short story is 8 turns. Using Inkvite allows you to come up with some very interesting and usually pretty funny stories and they can quickly change depending on the writer. When you sign up for Inkvite you will be asked to create a Pen Name. You will then have the opportunity to connect with Facebook and Twitter so you can quickly connect with your friends. When you decided if you want to write a solo story or with friends, you have the option to select up to 3 friends or even chose random writers to collaborate with you. Inkvite allows you to choose from 12 different genres. From there you can start your creative story. I find that this app is very fun and unique. Writers everywhere will love it and the stories that others have written and published can easily be read. You will have an unlimited source of free short stories to read at anytime. The overall layout and design of the application is great. Invite is currently a FREE application in the Apple App Store and allows you to enjoy a new and creative twist on writing. 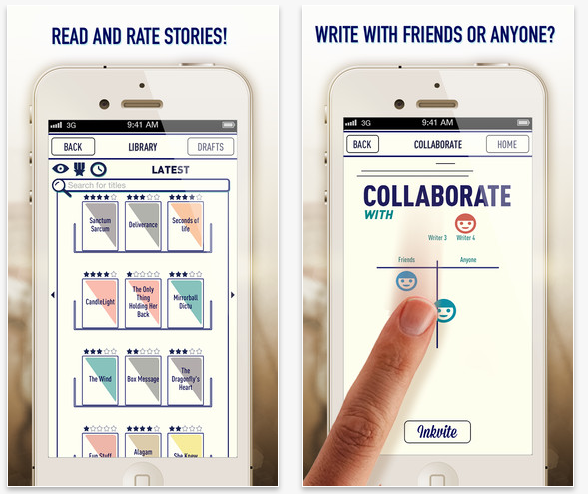 If you are interested in writing short stories this is a must have app. Check it out today.